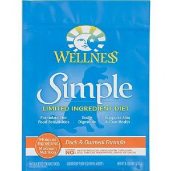 Shop for the best brands of dog food at VetDepot.com. A dog's immune system is supposed to differentiate between real threats and the benign things that dogs come in contact with every day. Within the gastrointestinal system, threats can include viruses, disease-causing bacteria, parasites, abnormal cells, and toxins. Appropriate foods do not pose a risk to dogs, but sometimes the immune system makes a mistake. When the dog's body starts to incorrectly recognize parts of the diet as foreign invaders and mounts an immune attack, a food allergy is the result. "Dogs of any age can develop food allergies, and a recent change in diet is not usually associated with the onset of clinical signs." The cause of food allergies in dogs appears to be primarily genetic. Certain breeds are at higher than average risk, including Labrador Retrievers, Cocker Spaniels, Golden Retrievers, German Shepherd Dogs, Shar-Peis, and Poodles. Food allergies make dogs very itchy. The itching may be localized to particular parts of the body, for example the face or hind end, or be more generalized in nature. 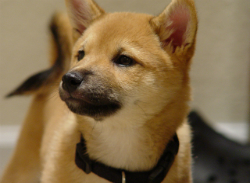 Recurrent ear infections are also commonly diagnosed in food allergic dogs. In addition, some individuals may experience gastrointestinal problems such as diarrhea, loose stools, straining to defecate, increased flatulence, a rumbling stomach, vomiting, and poor appetite, but a lack of GI symptoms does not rule out a diagnosis of a food allergy. Dogs of any age can develop food allergies, and a recent change in diet is not usually associated with the onset of clinical signs. In fact, many dogs that are diagnosed with food allergies have been eating the same diet for years. Unless a dog begins to eat a new food, its itchiness should remain fairly consistent, not changing with the seasons, moving to a new environment, etc. Many dogs with food allergies can also have other concurrent conditions that cause itchiness. Infestations with fleas or other parasites, skin infections, and/or environmental allergies to pollen, mold spores, dust mites, etc. can all occur simultaneously with food allergies. Therefore, a comprehensive dermatological assessment should be part of the work up in any dog suspected of having food allergies. This may include a skin scraping, fungal culture, skin cytology, microscopic exam of ear swaps, empiric use of medications to eliminate difficult to diagnose parasites, skin biopsies, and environmental allergy testing. Treatment for any concurrent diseases is an important part of managing food allergies in dogs. The virus attacks rapidly dividing cells in the body. The gastrointestinal system is its primary target, but parvo can also have a direct adverse effect on the cells of the immune system. This development not only lessens the dog's ability to fight off parvovirus, but also puts it at risk for secondary bacterial infections, often originating from within the compromised gastrointestinal tract. These infections can result in pneumonia and other potentially life-threatening complications. In very young puppies, the virus can attack cells within the heart. These dogs may either die suddenly or go into congestive heart failure and experience difficulty breathing, fluid build-up in the body, and extreme weakness. The only way to definitively diagnose a food allergy is through the use of a dietary elimination trial. Dogs must be fed a food that is either made from protein and carbohydrate sources it has never encountered (e.g., rabbit and potato) or that have been modified (hydrolyzed) in such a way as to no longer be recognizable to the immune system. Several different pet food manufacturers make foods that are appropriate for dietary elimination trials. Products that are available by prescription only are superior to those that can be purchased over the counter because the former benefit from strict quality control measures and do not contain trace amounts of common allergens. Home-cooked diets are also appropriate for dietary elimination trials but should be designed by a veterinary nutritionist. Whichever elimination diet is chosen, the dog must eat that food and that food only for approximately two months. During that time, no supplements or flavored medications should be given. If the dog's symptoms improve during the trial and return when the old food is fed, a diagnosis of food allergy can be made with confidence. The only way to treat food allergies in dogs is to avoid feeding the offending ingredients. Once the diagnosis is made, owners have the choice of continuing to feed the food from the elimination trial or trying to determine what the offending ingredient(s) in the old diet were. A simple way to do this is to look at the ingredient list, pick out the likeliest of offenders, and add them one by one to the elimination diet. Here's a case example. A dog's itching and loose stools resolved when eating a salmon and quinoa diet but returned when it was fed its old chicken, corn, and wheat-based food. The owners first added a small amount of wheat cereal to the diet. Symptoms quickly developed again but resolved when the wheat was removed. The same thing happened when strips of cooked chicken breast were added to the diet, but the symptoms stayed away when corn was supplemented. Therefore, any new dog food for should be completely free of wheat and chicken, while corn is of no concern. Many top dog food brands offer limited ingredient formulas for dogs with food allergies. 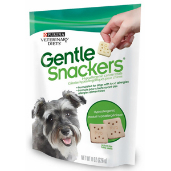 Some examples include: Wellness Simple Solutions Duck & Oatmeal Dog Food, Natural Balance Sweet Potato & Fish Formula, or treats like Purina Gentle Snackers Hypoallergenic Dog Treats. Because dogs have a well-deserved reputation for eating almost anything that they can access, allergic flare-ups are always a possibility. In one study, eating a single corn chip was enough to cause a dog with a corn allergy to develop symptoms. Mild itchiness can be treated with topical corticosteroid medications. More severe or generalized itching and/or gastrointestinal signs respond best to a short course of systemic corticosteroids (e.g., prednisone). Of course, the offending food should also be removed from the dog's environment to the best of the owner's ability. Food allergies in dogs are a life-long problem that cannot be cured, but with diligence and attention to detail, they can be effectively managed. Hill's Evidence-Based Clinical Nutrition™ for Dermatology Specialists, ©2007 Hill's Pet Nutrition, Inc.
Canine Food Allergy (Cutaneous Adverse Food Reaction). Sandra R. Merchant DVM, Diplomate ACVD. Louisiana State University. Dermatology Continuing Education Seminar. Evaluation of the clinical and allergen specific serum immunoglobulin E responses to oral challenge with cornstarch, corn, soy and a soy hydrolysate diet in dogs with spontaneous food allergy. Jackson HA, Jackson MW, Coblentz L, Hammerberg B. Vet Dermatol. 2003 Aug;14(4):181-7.